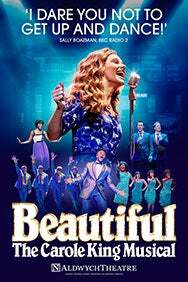 We do not curently have theatre tickets available for Beautiful - The Carole King Musical. This could be because we have simply sold out or it could be that this show is no longer running. The information on this page remains purely for historical and informational purposes. The Olivier, Tony and Grammy Award-winning Musical, Beautiful  The Carole King Musical is now playing at London’s Aldwych Theatre. Carole King, the chart-topping music legend, was an ordinary girl with an extraordinary talent. She fought her way into the record industry as a teenager and sold her first hit, Will You Love Me Tomorrow, when she was just seventeen. By the time she was twenty she was writing number ones for the biggest acts in rock ‘n’ roll, including the Drifters, the Shirelles, Aretha Franklin and the Monkees. We recommend patrons arrive at least 15mins in advance of the show start time. Security checks will be carried out upon arrival at the theatre, please be aware that your bags will need to be checked before being seated. The amazing storyâ¦with hit songs told through laughter and tears. I enjoyed every minute!